Seriously? I have been using Regionnaires for years. How many of us are sick and tired of the term “Region Rat?” It is a derogative term that paints us as a low class bumpkin living in pollution, political corruption and carrying guns to protect us from one another. It is gleefully played up by those folks downstate and neighboring States to pigeon hole all of us and to impart a negative perception of all whom, unfortunately to them, have to live here. Too many of us have bought into this image and some actually take pride in it. That false pride is nothing more than a weak attempt to dispel the hurt and shame that others want to hand us. We need you to become a Regionnaire. Regionnaires are concerned and engaged citizens who love Northwest Indiana and aspire to be leaders in transforming the culture and perceptions of this Region for the 21st Century. Northwest Indiana is unique and privileged in being the Steel Capital of the USA, hosting the largest private investment in State history at the BP Whiting Refinery, having both a State Park and National Park celebrating the Dunes and Lakeshore and being the true crossroads of the Midwest. Of course we have challenges, who doesn’t in this global economy and evolving 21st century? It is high time we stand up for ourselves and let Indiana and the neighboring States know that we are a true asset for the future. Being the “right side of Chicago”, a global economic city presents more opportunity for us than any other region in the State. Our Blueways and Greenways trail projects give us a place as a national destination for various sports such as paddling and cycling. We have fine healthcare facilities and schools and the list goes on. There is a downside. We need to address legacy issues that continue to plague us. Foremost among them are too many examples of political corruption. We must show the world that we have had enough and demand change from our public officials. As a first step in order to address the images of public corruption here, the NWI Quality of Life Council, the Shared Ethics Advisory Commission and the Lake County Advancement Committee have planned a special event for the early evening of Tuesday, October 18th from 6:30 pm to 8pm at Merrillville High School auditorium, 276 E. 68th Place, Merrillville. This evening’s theme is “Your Right To Know”, a public meeting where information will be shared about the necessity and how-to’s of gaining access to the details of local government political operations and decision making. Following their introductory remarks and presentations, audience participation will be encouraged to commit to action by soliciting leaders and community groups to carry the message forward that we expect our elected officials to behave ethically and support adoption of ethics ordinances along with providing training of all municipal employees in ethical behavior. Other public access opportunities will also be discussed. We will share available resources and facilitate where appropriate the formation of these Regionnaire groups. Please be aware that this meeting is not for malcontents, political activists or those harboring a personal agenda. This meeting is for those concerned, average residents who are tired of the region being portrayed as corrupt, tired of the behind the scenes decision making and want to make a positive effort to change Northwest Indiana. We can make a difference! Regionnaires will also celebrate and honor those many elected officials and public servants who are exemplary and do not represent the exceptions that give all of Northwest Indiana a bad name. Please RSVP to Dawn Williams, dwilliams@nwiqlc.org, to reserve a seat. NWI Quality of Life Council, Inc.
SWEETNESS author talks with Stew For Lunch this Friday! Jeff Pearlman will be Michael D. “Stew” Stewart for a interview Friday October 7, 2011 12:10pm Chicago Time. Listen in on AM 1230 WJOB Hammond, IN or online at www.wjob1230.com or download the free WJOB app and listen on your I-Phone or Android device. Many would say Walter Payton was a man among men. A prolific running back, a legend on the football field, a father, a loving son, a role model to millions, and one of the most beloved sports figures in NFL history. And yet Payton kept few close friends, dodged the media and built a wall between his personal life and the rest of the world. Even his own autobiography, Never Die Easy, was rife with inaccuracies. What was behind the records, that smile, and the legend? Who was the man? These are the guiding questions of Jeff Pearlman’s Sweetness: The Enigmatic Life of Walter Payton on Sale from Gotham Books on October 4th, 2011. Twelve years and nearly 700 interviews later, Pearlman’s dogged reporting brings together the complete life of Walter Payton. Sweetness is packed with news-making revelations. It includes startling details about Payton’s womanizing, his oft-selfish and self-absorbing behavior and his failed marriage. It also reveals his kindness and trust in others; the beautiful way he treated fans, and the impression he left on all who played with him. Known for his physical prowess and his preternatural agility on the football field, Payton was also an emotional lockbox. His perfect marriage and locker-room prankster antics were fronts to a womanizing, questioning, lonely man. But Sweetness is not a sleazy tell-all. It is instead an intimate look at the man who made women gasp, men marvel, children smile, and a city dance together in a Super Bowl Shuffle. From Payton’s childhood in segregated Mississippi, where he helped curtail racial strife by becoming the star of his integrated high school’s football team, to his college years and his thirteen-year NFL career, Sweetness brims with stories of all-American heroism—on and off the field. Payton embodied an American dream—he worked hard, he played hard, he gave to the community and he cried when he needed to. Nicknamed Sweetness by teammates in a college all-star team, the moniker personified his dazzling running style, as well as his compassionate and trusting persona. He took pleasure in randomly stopping awe-struck Chicagoans on the street to ask how their day was going; he once entrusted his Super Bowl ring to a high school kid for the weekend. Payton was a talented but flawed American icon. Arguably the best all-around football player in NFL history, his life was cut short by a rare liver disease and cancer. His death in 1999 shook the city of Chicago and the country. His legacy lives on in the form of foundations, the oft-played “Super Bowl Shuffle” and a litany of stories of his antics, his heart, and the barriers he broke. 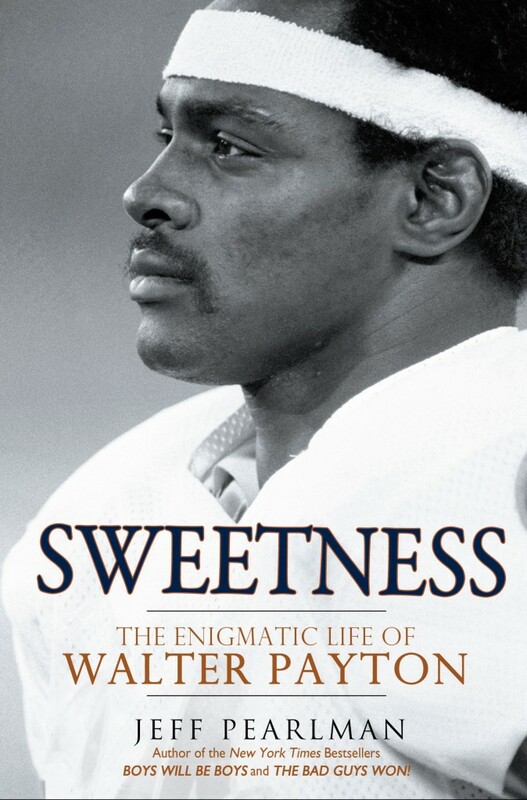 Sweetness is the definitive biography of Walter Payton. Through high school, playing college football with his brother, the early days of a ragtag football team called the Bears, the influence of Ditka, the small salaries and the loyalty to an agent and a friend, through the strain of fame and success, the tears at finally getting to play (and the depression after failing to score a touchdown) in a Super Bowl, and his eventual boredom and fear in retirement, Sweetness is the story of a man.